Tax season is a chore for everyone, as running through a year’s worth of receipts, financial documents, and tax forms can be a challenge even for the most organized individuals. Learning how to file tax reports online has become an increasingly popular way to simplify the process, letting you fill out forms on your computer instead of paper, and avoiding a trip to the post office. As with all online activities though, it’s better to be safe than sorry. Sensitive tax forms can be stolen, copied, or seen by prying eyes and could lead to identity theft and serious consequences. Before filing your taxes online, read through our six easy steps to help you securely complete the process to rest easy knowing your taxes are done and your identity is safe! No one likes tax-filing season, even though every adult in the US has to participate in the complex process at least once a year. However, many people are skipping the complications and going online to file taxes. Indeed, filing taxes on paper isn’t just slower—it can actually cause you problems. Returns filled out on paper are 41 times more likely to have an error than those filled digitally. The popularity of e-filing taxes has soared as more people discover how much more efficient the process is compared to using paper forms. In 2017, 92% of submissions for tax returns were filed online, a rate that has been steadily increasing since 2001. Although it makes your filing headaches go away, using the web to submit your returns means exposing yourself to potential fraud and identity theft. However, it doesn’t have to be scary to make your life easier. 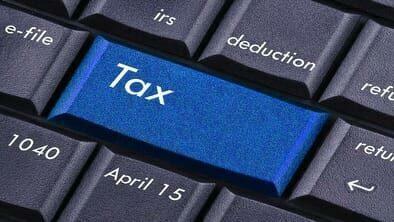 You can safely submit your taxes digitally by following these six easy steps! We spend so much time online surfing different websites these days that it can be hard to know what’s penetrating our defenses and what is being filtered out. When you start e-filing your taxes, programs such as keyloggers, backdoors, and other hacks can send your information to fraudsters without you even realizing they’re there. This isn’t an uncommon problem, either, as nearly 90% of US home computers have at some point been infected with spyware. Your first step, before inputting your first zero on your forms, should be to perform a deep sweep of your computer. Look for the best antivirus software on the market, run a complete scan, and make sure that your information is safe before you start entering and submitting it to the IRS. Once you’ve made sure there aren’t any hidden viruses or malware on your computer, you can start preparing to actually work on your taxes. Keep in mind that when filling out your tax returns, you are including information that isn’t just private, but highly sensitive as well. A hacker with your Social Security Number, tax ID, or even simply your name and date of birth can wreak havoc on your life. Therefore, before you start putting your information out there for the world to see, you should take time to create a secure computer environment and a robust and private connection to upload your results. You can begin by subscribing to an online identity theft protection suite which will scan the web and dark web for any trace of your personal information being used or sold as well as gain the tools needed to avoid fraud on your computer. Similarly, protecting your connection is vital, as transmitting unencrypted information is an easy way for hackers to intercept and use your data. Find a strong virtual private network (you can read the best VPN reviews here) that will fully encrypt your communications and avoid anyone from snooping on your PC. The explosion of e-filing has led to the emergence of hundreds of tax return services that help people e-file their forms. With such a large and crowded market, though, come the problems associated with them. Namely, it’s tough to wade through hundreds of companies and find the one that works for you while delivering safety and peace of mind. This step is vital, though, as it can mean the difference in filing your taxes or potentially losing your identity. Remember, deals that look too good to be true generally are, and companies that make outlandish promises put up the first red flag. Do your homework and take advantage of applications that have a proven and well-publicized record of trust and success. Companies like H&R Block, TaxAct, and TaxSlayer all have sterling reputations, and can help simplify the process thanks to professional assistance and the right digital tools. Most people who e-file their tax returns do so through a variety of software applications available from companies like TurboTax and CompleteTax, which automate large portions of the process. For many, though, simply downloading the software once is an invitation for applications to constantly irritate users with notifications, pop-ups, and warnings that their software is out of date. The truth is, these programs employ this commonly annoying behavior to get people to update their programs for a reason. New updates aren’t just aesthetic; many times they include security patches, better systems for handling data, and other improvements that make e-filing a safer process. Moreover, they fix known vulnerabilities that have become public. When you utilize software that is out of date, you increase your risk of being hacked because your software may not have the tools to stop an attack. Using a strong password(s) and keeping them secured in a strong location also helps your privacy. Some of the best password managers also improve security by helping to protect these sensitive credentials as a lost password is as dangerous as a stolen computer in the digital world. With protection installed and your computer cleaned, you’re ready to dive into the complex tax code to finish your returns before time runs out. This step is straightforward though it involves two layers: filling you’re your tax returns and being careful about how you’re completing it. Strong protection like an antivirus and a VPN are excellent steps to take towards protecting your identity, but they’re not infallible and they are not cure-all solutions for enhanced cyber-security. Make sure that when you work on your tax returns, you do so somewhere you trust, and you avoid taking unnecessary risks. This includes doing your taxes at home or places when you have a private wi-fi connection that is password-protected. Similarly, avoid doing things directly on the web when possible. Download forms and fill them out before submitting them to avoid your data being intercepted. Most importantly, stay vigilant and work to reduce your potential weak spots that are vulnerable to attacks. Unbeknownst to most people, every action they take online leaves a small trace, whether as a record or as a series of files left on a repository somewhere. No matter how robust your home firewall is, odds are your security is not fool-proof, and information can be stolen from places you assumed to be secure such as your email, social media accounts, and more. Countless examples, from Amazon to Equifax, highlight how unsecure and penetrable even the most robust systems can be. Keeping your files on cloud storage is not generally advisable, as they contain all the information a hacker could need to steal your identity in a matter of minutes, nor is a simple folder on your PC. You can work to remove your information from your storage, or find applications that can encrypt your folders to further protect your data. Similarly, you can keep your tax information on external hard drives or flash drives to reduce the likelihood of others finding it. Avoid working on your taxes in places with public wi-fi connections such as cafes, libraries, and bookstores. Don’t trust free security tools that have little online presence. They can be loaded with malware and secretly mine your information without your knowledge. Don’t repeat your passwords and credentials for multiple sites, as it increases the chance that if one account is breached, they all will be. Don’t work without a backup. Taxes take significant time and losing all your work accidentally can cost you hundreds of dollars in late fees and fines. Don’t rush to fill your taxes. It’s a complex and time-consuming process, but a missed decimal or misplaced zero could have serious implications towards your overall costs. Always secure your computer before getting started. You never know who may be trying to watch. Do make sure you always visit secured websites. Check for SSL certificates (the padlock icon on most browsers), and URLs that begin with HTTPS, meaning they’re encrypted. Do your homework on the best e-filing software. Find a combination of protection-oriented features and easy tax-filing tools. Make unique robust passwords for all your accounts and folders. Include combinations of words, numbers, and characters to increase their difficulty. Be willing to seek professional help. You don’t need to be a CPA to file your taxes, but they can significantly help you with the process. Next > Is What You're Looking at Considered an 'Acceptable' Ad?